If you have become a true Coloring Book Addict by now you are sure to have quite the collection of colored pencils, pens, markers and more and NOW you need to organize your art supplies. There are so many options that I will just be sharing several that might meet your artistic needs, we colorists are all so uniquely individual. I honestly don’t know how I lived before I recently discovered the RASKOG rolling cart. Once you have one you might want more. I’ve watched numerous video reviews on Rakog versus the Michaels Brand and Costco brand and everyone agrees that the RASKOG is da bombdiggity in all sorts of art supply storage. What I love most about it is how sturdy it is AND that I can store ALL of my colored pencils, erasers, sharpeners and books all in one spot and then roll it away when company comes. You can also clip an LED light on the edge of it in case you need more light in your family room which is where I always end up coloring. If you have an IKEA store nearby then go buy one. I promise you won’t be sorry. They no longer have the aqua blue color (BOO!) so I bought the cream and if I get really ambitious I’ll spray paint it. However, I don’t think I can live long enough without it to do that.. so I may just wait for them to bring out a blue again. They are super easy to put together and SO sturdy. The middle shelf can be moved up or down but I just left mine right in the middle. The other alternative that is almost as good is the one at Michaels, it looks pretty identical but isn’t quite as sturdy. It’s part of Michaels Everyday Value selection so you can’t use your 40% off coupon on it, however at $30 it’s pretty reasonable. The advantage is that they DO have lots of color selections. Lexington 3 Tier Cart in Mint, White, Pale Pink (Blush), Bright Pink, Champagne, Rose Gold, Grey & Black. Some people like to keep their pencils in the original tins but I find these less than satisfactory. I find I like to color all over the place, in front of the TV, our library coloring events and on the patio at the Starbucks so I want my pencils to be easy to transport. I have been lusting after these cute pencil rolls on Amazon that hold 72 sticks of color and on Amazon Prime Day they went on sale so I snagged 3 of them. These are made by Creoogo and range in price from $10-14. The price for the 36, and 48 are the same as for the 72 pack so I’d get the largest one. You can also fit your gel pens and watercolor pencils easily in these bags and there are extra wide slots at each end to hold your eraser, water brush or other coloring tools. They come in 2 sizes, 72 pencils or 160 pencils. I’d opt for the big one even if you only have 72 pencils for now, you will likely get more or it can also hold your gel pens or markers. Click to Order Amazon US, UK & Canada. I recently started adding Mixed Media pieces into my coloring books and stumbled upon this bag that one of the people in my class had. I fell instantly in love with it. SO many supplies will fit in this bag and all the zippers keep things nice and organized. Click here to Order and also see a video that shows you all the amazing that is inside this cutie. 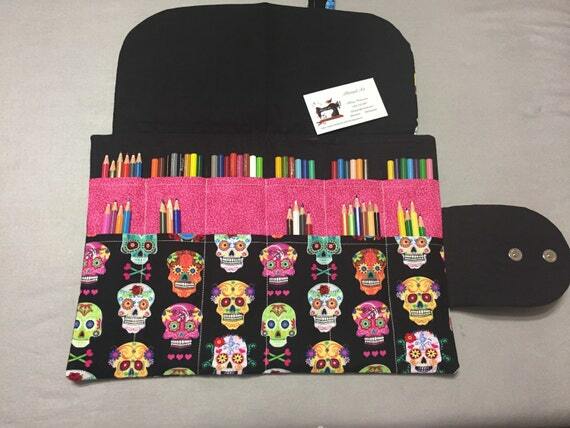 This canvas pencil wrap is the least expensive with a 48 and a 72 pencil option. The 48 pencil holder doesn’t have individual slots for the pencils, instead, you can group by color while the 72 returns to the individual slots for each pencil. This Etsy store has some gorgeous pencil wraps with really cute fabrics, she says this fits 80 colored pencils or 50 markers Click here to order. She also has this GIANT Coloring Pencil Organization Bag that holds 220 pencils, 6 books and a partridge in a pear tree. 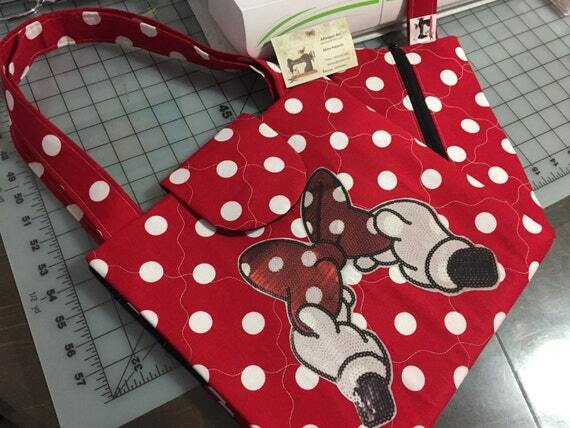 If you can’t get enough Disney, this mid-size bag is just adorable! There are all sorts of cute handmade pencil organizers here to shop through on Etsy as well. 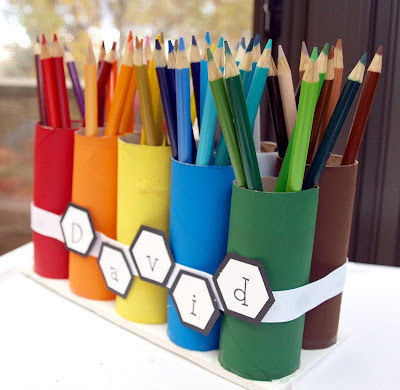 If you are a DIY kind of person, the Doodle Craft Blog has step by step instructions to make this cute pencil organizer. I originally purchased the Derwent Canvas bag that holds quite a few supplies along with 132 pencils and it also has extra sleeves available for even more pencil storage. The zippered pockets also hold erasers, sharpeners, and other supplies for you in this nice sturdy bag with a shoulder strap. Two pencils fit in each space on the 3 dividers that fit on the binder rings and you can buy more of these if you have more than 132 pencils. Pens also fit nicely in this bag but it’s not big enough to stick a full-size coloring book into but the postcards and portable books fit nicely in the inside or the outside pocket. There is a zipper pocket inside for your erasers and sharpeners. The shoulder strap is removable. I have had this for about 9 months now and it is still in perfect condition. I did buy an additional set of sleeves and there is still room to spare. This zippered canvas bag opens to reveal all 72 of your colored pencils and received rave reviews from verified purchases (Not the “I got this for free” folks) One reviewer even said he got all 150 of his prismacolors in with room to spare. BTSKY 160 slot canvas pencil holder. Finally, a zippered canvas bag that fits all your Prismacolors in one place. This one comes in several colors too. 150 elastic spots for pencils or pens + 10 extra spots for blenders, your Gelly Roll Clear Glitter Pen, White Gel Pen for highlighting, Eraser pencils and whatever else your essential tools are. (You might already have 1 (or 50) 31 bags in your closet already and any of those with lots of pockets are perfect. I found this stackable interlocking storage and now have two of them. That top blue part is removable too which is what I did and then I used that little bin to store my erasers and sharpers and other ephemera. 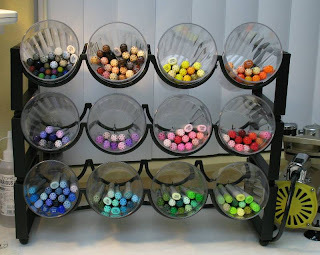 This is where I store my markers since they are to be stored horizontally versus vertical. 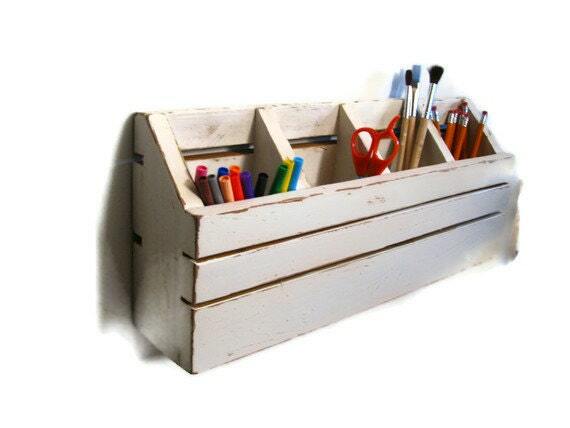 Wooden Storage Drawers are quite popular for those folks who have a dedicated area to color in. These pencil drawer storage units are very popular, be sure to read the reviews for the one you are buying as some manufacturers are better than others. If you have a collection like I do you will probably need more than 1. 2 Drawer Storage holds about 90 pencils or a set of 72 with blenders erasers & a few Gelly Rolls. If you prefer to see all your colors at once you might like these upright colored pencil holders like this one I found on Etsy. 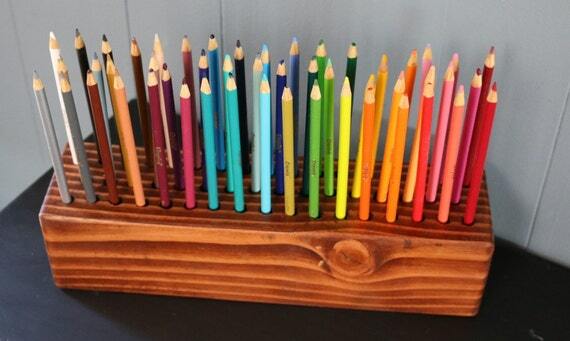 It holds 50 pencils so you might need more than one, or if you have a handy person around, get them to make one for you. Or this one! it only fits 25 pencils, though. I’d probably decorate any of these that I bought, to be honest. I have a bit of a mason jar obsession, if you need a storage solution for everything in your home, this is my go to. For you Kawaii lovers, this is perfect for you, or just leave them without the faces like I have done. I think I like this idea better for the toilet paper rolls. The one above isn’t nearly big enough for my pencil collection from 20 free ways to organize. She has a bunch of other great ideas for organization too. Check out this DIY idea with full instructions on YouTube. We would love to see your storage ideas on our social media accounts. Please tag us anytime.. Thanks for this incredibly useful and timely post. I am as getting tired of rooting around in the bottom of my shoe-box size pen box! I really like the look of the drawers, but at over £50 here in the UK, may look at other alternatives, so great you have so many types. Haha, re: Kitty:-) I used to have a cat, she did love ‘helping’ colouring-in,,especially when they see you got to a fiddly bit, and thought it good to bite end of pencil, so I know where you coming from;-)!! Tried to order from Etsy but not able to change the credit card I wanted to use. Did get one from Amazon. 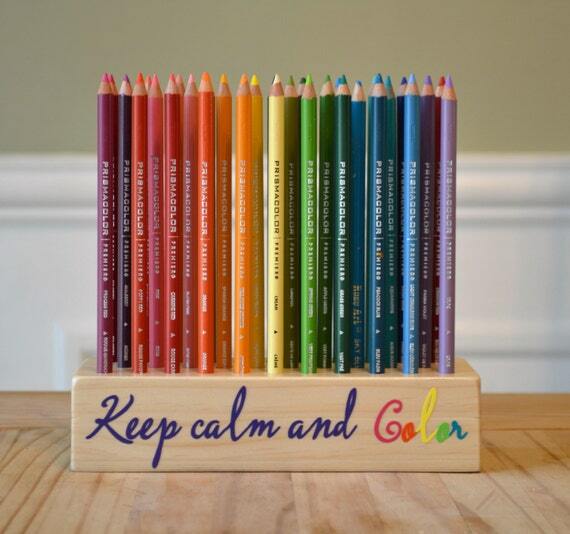 Thank you for sharing these great ideas for places to store all coloring pencils, markers, etc. I especially like the wooden container, Chrissy. Oh, wow! So many ideas for organizing my coloring supplies. Now you have taken away every excuse I have for not getting organized. I like that you presented options for any budget and/or craft level. I really like the wood upright pencil holders. However, I am very limited on space, so will probably opt for a fabric pencil roll. I use empty frosting containers n found an old Tupperware bread box. It let’s me keep similar gel pen colors, different types of pencils separate n markers in one area. However I am coloring alot n this solution is ok but not perfect. I use crayons also. Please help ! I have a lot of different brands of colored pencils. I keep them separated because I find different papers respond better to different pencils. For instance, I love using Prismas in my Hanna Karlzon books, I find the Polychromos tend to smear on that luscious paper. Johanna Basford books I like to use my polys. So for my big fancy sets I keep them separated. For my less expensive ones I do tend to just put all the greens in one cup, all the pinks & purples in another. I’d experiment and see which one you prefer. After all, this is YOUR hobby so do the one that makes you happy. I have to confess I kind of like reorganizing my art supplies every so often to see what’s in there.